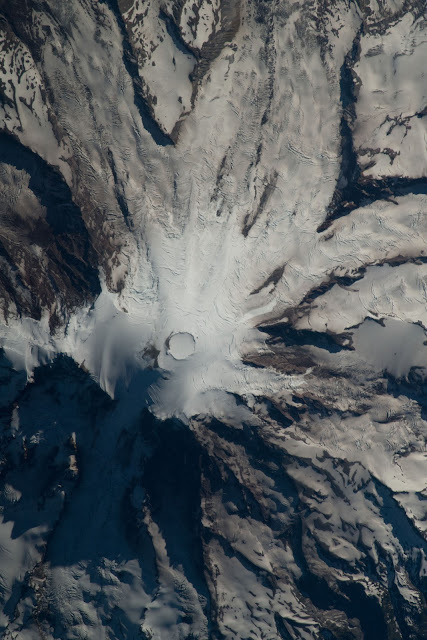 Stratovolcano Mount Rainier is pictured as the International Space Station orbited about 256 miles above the state of Washington in the United States. Mount Rainier is the highest mountain of the Cascade Range of the Pacific Northwest, and the highest mountain in the U.S. state of Washington. It is a large active stratovolcano located 59 miles (95 km) south-southeast of Seattle, in the Mount Rainier National Park. It is the most topographically prominent mountain in the contiguous United States and the Cascade Volcanic Arc, with a summit elevation of 14,411 ft (4,392 m).